Valentine's Day can be a holiday that causes some people to fail at their New Year's Weight Loss Resolution because of all the sweets, eating out and desserts that they eat while celebrating with loved ones. But it doesn't have to be that way this Valentine's Day if you have SunRidge Farms organic and natural snacks and new All Natural Fair Trade Bulk Chocolates! Plus, they are the perfect gift to give this Valentine's Day for the chocolate lover in your life! Not your standard chocolate bar, the new Fair Trade Certified Bulk Chocolates are available in refreshingly different options, made with Fair Trade Certified Cocoa and can be found in the bulk aisles of Whole Foods Markets nationwide. And, the beauty of bulk chocolates (in addition to reducing packaging waste) is that you can stock them in a chocolate jar so they can be enjoyed well beyond Valentine's Day! Dark Chocolate Sea Salt & Turbinado Sugar Almonds - crunchy California almonds covered in dark chocolate made from Fair Trade Certified Cocoa, then lightly dusted with sea salt for an addicting, sweet and savory treat! Organic Dark Chocolate Espresso Beans- Fair Trade Certified: Organic Espresso Beans coated in Rich, Dark Organic Chocolate for a peppy, decadent treat! These are all so delicious! My husband loves the Dark Chocolate Coconut Chews when he is craving some sweets and I turn to the Dark Chocolate Raisins! And when we are lacking sleep and need a little sugar and caffeine, the Dark Chocolate Espresso Beans are a must! I am always impressed by their Fair Trade, Organic and Natural sweets selection and your mouth will water just looking at their selection! And if you are more of a salty snack person or are really committed to reaching that goal weight and need some healthy snacks, SunRidge Farms has you covered for that too! 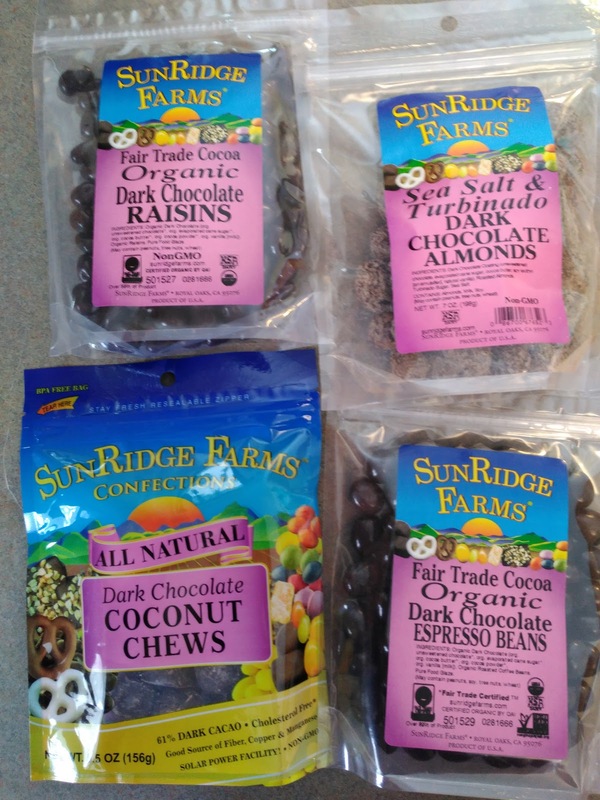 SunRidge Farms is really one of my favorite snack and chocolate companies and when I have their healthy snacks in my cupboard I seem to stick to my diet better and lose those stubborn pounds! And I feel a lot less guilty when snacking on their chocolates because they are organic, Fair Trade and natural! Make sure to check out their full selection of products and prepare to have your mouth watering! 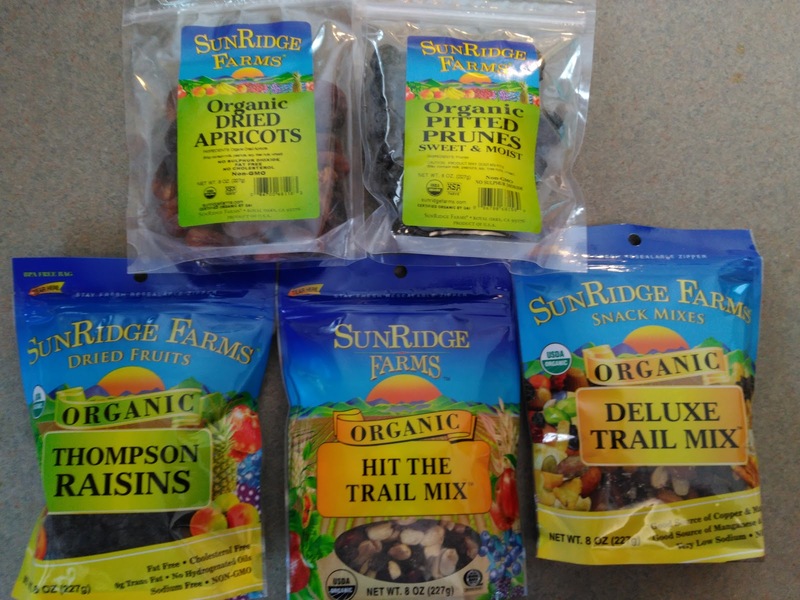 You can purchase SunRidge Farms products at Whole Foods and online at the SunRidge Farms website.